James Sadlier (left) and Ben Heron. 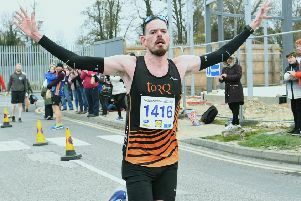 Peterborough Athletic Club have emerged from a spell in the distance running doldrums and now boast an impressive senior men’s squad, put together by astute coach Paul Larkins. After winning the Cambridgeshire Road League for the past couple of years they are now starting to make their mark on bigger stages, and a good showing in Saturday’s South of England Cross-Country Relays at Wormwood Scrubs helped to enhance their burgeoning reputation. The city club fielded two senior men’s teams with the A team finishing 13th, and the B team coming home 34th out of the 44 teams to finish. Phil Martin ran the final leg for the Peterborough A team, making up a couple of places after solid performances by the ‘James Gang’ of James Whitehead, James Sadlier and James Skinner. The B team comprised Oliver Mason, Jon Peet, Steve Hall and former four-minute miler Paul Larkins. The Under 17 boys race featured an exciting battle between Peterborough AC and Nene Valley Harriers with the Harriers finishing one place behind their arch rivals in 11th. Matt Dowling ran the fastest leg for Nene Valley, completing the 3km circuit in 11:35, while Patryk Szprengiel (12:22) ran Peterborough’s best time. Nene Valley also fielded an Under 15 boys team, which took 21st place in a highly competitive race. Matt Colman impressed with a 7:25 clocking on the 2km loop. With Peterborough AC making great strides and Nene Valley as strong as ever, it looks like being a fascinating winter with both clubs eager to prove themselves as the kings of Cambridgeshire cross-country. Athletes from Nene Valley and Peterborough AC represented the region in the annual cross-country fixture between Cambridge University, the RAF and the Eastern Counties. Peterborough’s Ben Heron was first local home in 16th place with Nene Valley’s Michael Channing finishing 22nd. A Peterborough AC trio of Shaun Walton, Simon Fell and Amittai Ben-Israel came home 25th, 30th and 31st respectively. Nene Valley golden oldie Sean Beard completed the local contingent with a 40th place finish. The Eastern Counties team were runners-up behind Cambridge University. Long-distance running can become an obsession if you let it. Race organisers are introducing odder and odder events, safe in the knowledge that whatever they come up with there will be a clamour from runners wishing to compete. The Autumn 100, held at the weekend in Berkshire and Oxfordshire was a case in point . . . and all the entrants had to do was run 100 miles. Yaxley Runner Sharron Toms clocks up high mileage in her training, and in a moment of weakness decided this was the event for her. Never one to shirk a challenge, the 47 year-old mother of three stood on the start line at Goring on Thames early on Saturday morning knowing that she was in for the least relaxing weekend of her life. Toms took the race in her ever shortening stride, running throughout the day and night covering the 100 miles in just over 24 hours, and finishing 93rd in a field of nearly 300. “100 miles, now I can’t even walk” said a tired but proud Toms. Despite being an inspiration to many other local runners, it’s doubtful that any will be eager to follow in her tired and weary footsteps next year.